We’re getting the hang of this place alright… we’re waking up later and later each day. Almost entirely skipping the breakfast hour by the time we get out and about. It’s nice to relax and it’s also comforting to know that the evenings here are packed with music and food into the wee hours. Not so bad! 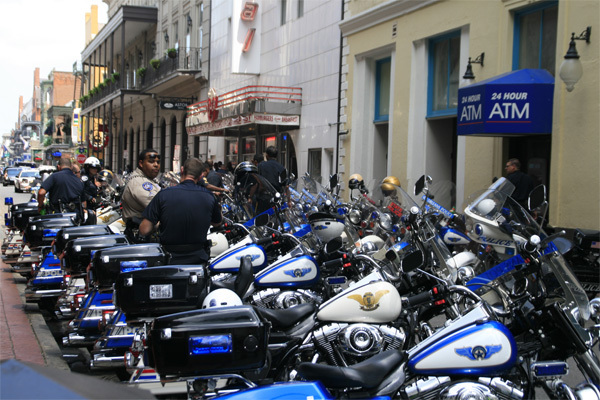 Yup, Mr. Bush was right on Bourbon Street. Actually you couldn’t see him but the police had blocked off the street and there were oodles people trying to get a peek at his massive entourage. We joined them because we thought it would make a hilarious photo… Bush actually on Bourbon street… where we looked for him yesterday! This thrilled us. 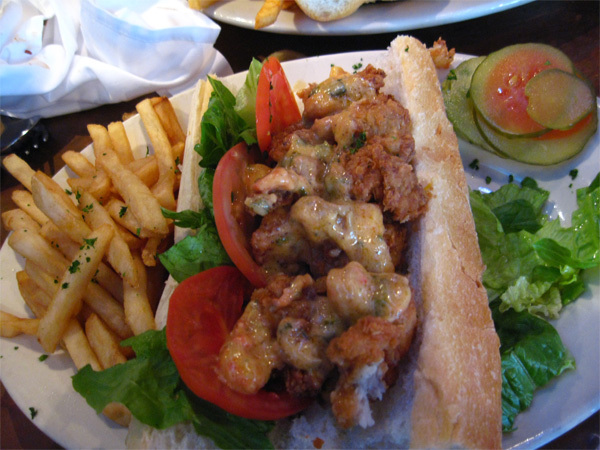 After that we hit Bourbon Street for lunch opting to eat some New Orleans Po’ Boy Sandwiches. I ordered the Alligator with Crawfish Sauce and Dennis got the Beef with gravy. Our review on this place is that the meat had lots of gristle and fat… the flavors were good but the quality wasn’t up to par. Oh well. More walking led us to the St. Louis Cemetery No. 1, a historic and supposedly “haunted” cemetery. We arrived late to find that it just closed. 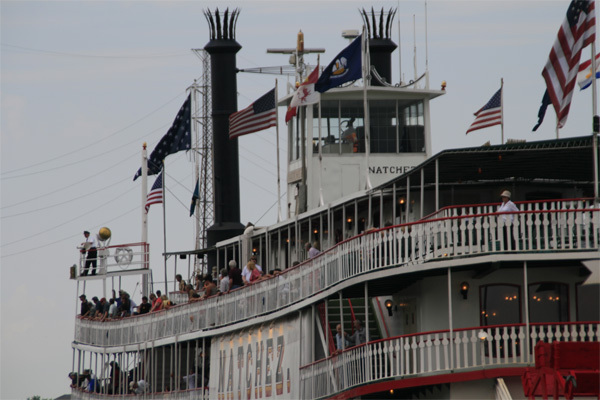 So we headed back to the Toulouse Street wharf to watch the Steamboats and relax. We decided to spend our evening close to the hotel in Faubourg Marigny on Frenchmen street. There’s plenty to do within a few blocks so our first stop was “Check Point Charlie’s. Suds and Duds “. A small aspect of traveling for more than a week or two is that you will have to do laundry at some point. 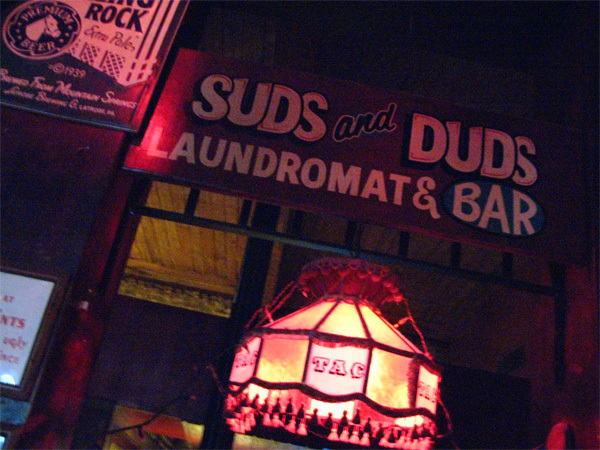 We got lucky this time and found Suds and Duds across the street from our hotel. Great concept… do your Laundry and have a few beers to boot. 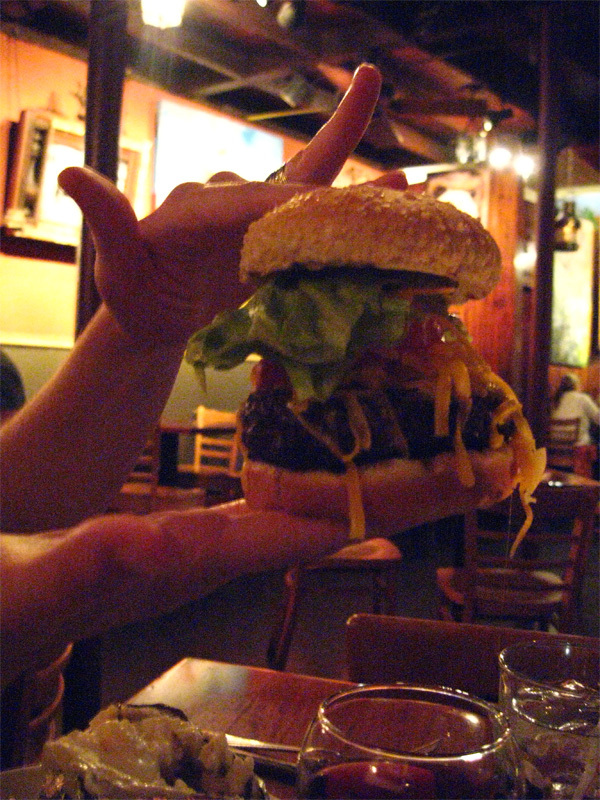 After a few drinks and folds we ventured up to “Snug Harbor Jazz Bistro” where we scarfed up some towering burgers, a bottle of wine and sounds of a local Jazz band. The brass and percussion melody’s waled from the open doors out onto the sidewalk. We strolled slowly enjoying it before returning to our hotel. 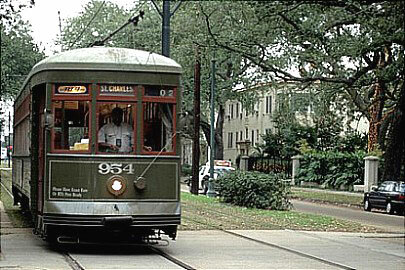 Ahh, tomorrow we promise to hit some landmarks… we’ve agreed on a “driving” day so we can get PAST Canal street this time… and into the other districts of the city. ok kids, its time for bubba gump! have you seen him yet? up the lazy river you go.